Safaris to the Selous Game Reserve and off the beaten track safaris. The cheapest way to experience Tanzania is by choosing a camping safari.These type of safaris are excellent for a person who enjoys outdoor activities! 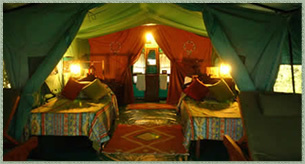 With our camping tours, we use our 4 wheel safari vehicles with roof hatches excellent for sight seeing. Mount Kilimanjaro is termed as the root of Africa. The most exciting part of the trip is that no trekking experience is required although one must be able to withstand the effect of altitude as well as the physical climbing experience.